The success of “The Sixth Sense” still surprises me. The film made just under $300million in the domestic box office, a phenomenal achievement considering it's small scale narrative limitations. If anything it’s a sign that audiences are willing to embrace quality without the formula elements of tentpole blockbuster films. 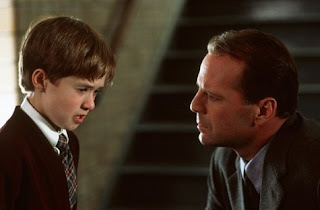 On the list of top grossing films of all time "The Sixth Sense" stands at number 30 in between “Pirates of the Caribbean: The Curse of the Black Pearl”, and “Harry Potter and the Order of the Phoenix”. In fact, amongst the top 50, it stands out like a sore thumb: it’s a rare non-animated film that isn’t or hasn’t had a sequel, it’s not for kids, its budget was a modest $40million, and it contains no special effects. “The Sixth Sense” is sparse on plot, characters, and action, and paced like a slow burning candle and with the volume of a whisper. But with basically four characters with limited locations and dialogue, M. Night Shyamalan managed to perfect the supernatural thriller genre and of course, with the help of one of the greatest plot twists of all time. Shyamalan’s four key characters are Malcolm Crowe (Bruce Willis), a child psychologist going through marriage troubles; Malcolm’s wife, Anna (Olivia Williams), is so aloof to Malcolm, she’ll barely even talk to him; there’s Malcolm latest case, Cole Sear (Haley Joel Osment), an anti-social young boy who’s stricken with some kind of psychological disorder; and there’s Cole’s mom, Lynn (Toni Collette) who’s recently lost her mother and continually struggles to bring up Cole as a single parent. Barely anyone outside of these four characters are crucial to the story. While Malcolm's wife appears to develop a relationship with a young co-worker and Cole gets bullied by some fellow kids at school everything is developed through conversations between these four characters. In keeping the dialogue quiet and minimalist “The Sixth Sense” becomes more rewarding with multiple viewings beyond just the cleverness of the twist. One of the themes of the film is parenthood and the importance of love and attention. Since Lynn is a single parent who can’t always go to every play, soccer game or even walk him home from school, Cole likely develops his extra sensory perception as a mechanism to cope with his loneliness. This connects to Lynn’s post-mortum reconciliation with her mother, who likely had a similar relationship with her. The film could even exist and be successful without “the twist”. The moment Bruce Willis discovers who he is is indeed a shocking reveal (and still sends shivers down my spine), the real twist occurs earlier in the third act when Malcolm and Cole discovers that his sight is not a burdon on him but a gift given to him to help the living reconcile with the dead. The build-up to the funeral scene is played out with perfect pacing and shot selection. “The Sixth Sense” wasn’t Shyamalan’s first film, in fact, he had directed two non-successful film, non-thrillers previously. So how did he make this monumental creative leap to craft such a true auteur instant classic? Perhaps the divine intervention which always creeps into his films. Enjoy. While I would never suggest that this is a bad movie, it is wholly indicative of how pathetic things have gotten in terms of audiences' susceptibility to plot mechanics. The first time I saw the picture on a big screen I was certainly taken with the style of the film and wanted to give it far more points than I ultimately could. The problem was that I knew - almost within the first fifteen or twenty minutes what the big plot twist was going to be. In fact, I was enjoying the movie so much that I was secretly hoping my instincts would actually be wrong - that the picture would NOT go where I automatically assumed it would. When it did, I was sorely disappointed and with subsequent Shyamalan pictures I was pretty much on to his obviousness in terms of story structure. What shocked me and shocks me still is how I appear to be one of the few who clearly saw the plot twist coming - so much so that I assumed everyone else would and that Shyamalan would know it to and that he'd take us into territory that NOBODY would ever imagine. Alas, he did not. He did, however, manage to dupe a lot of people into thinking he was actually better than he proved with that and subsequent pictures to actually be. I hear what you're saying. I actually didn't like the Sixth Sense too much when I first saw it. I didn't predict the twist, but when it did arrive, I still wasn't impressed. I've seen it several times since then and It actually gets better with age. I can't say I've seen it several times, but I have tried to watch it a few times and only made it all the way through on one more occasion. It's got a definite tone and voice, but the narrative is sadly lacking and most of all is one that promises to go to some very evil places. It doesn't though and winds up being merely the first of an annoying trend I like to call the "kinder, gentler horror film". I expect everyone in the movie - ghosts included - to start sing "Cumbaya!"